The COMMITTEE meets for the second time. The reason? Ask Jackie. A frantic afternoon in the BertO laboratory because, believe us, we are all excited and apprehensive when we face a new project. We are not talking about a millionaire contract but the creation of a new chair, of that which could seem to be just a simple chair. Which, let me tell you, is not so simple. For this reason, in our laboratory in Meda, the seven members of our Committee held a meeting (modeller, upholsterer, designer, planner, King Flavio, uncle Giorgio and Filippo) to develop the latest in a long series of challenging projects conceived by our Art Director Castello Lagravinese Studio. 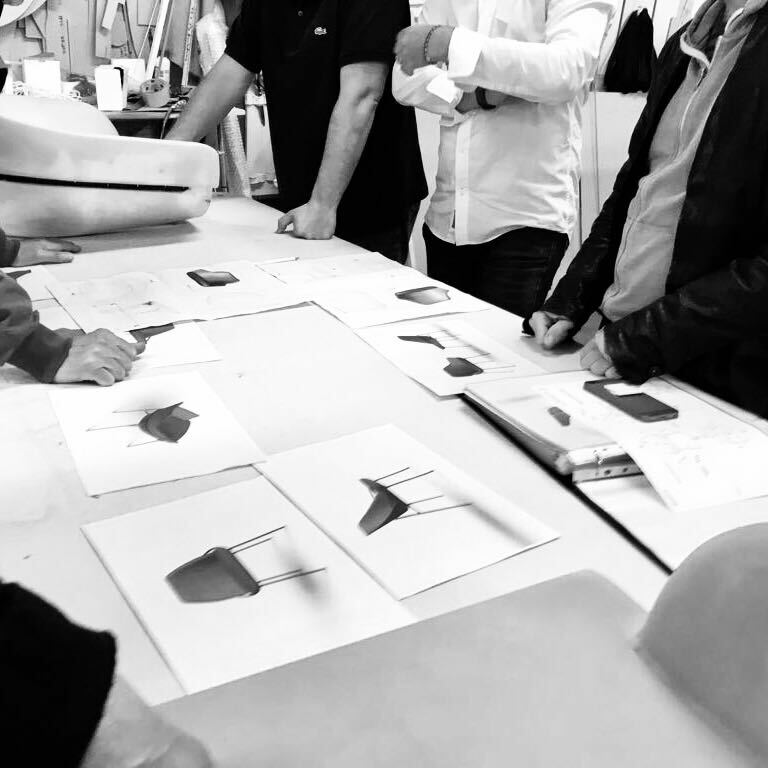 The COMMITTEE, formed during the prototyping of the Hanna Armchair, is made up of a group of men and women, all in harmony with the Spirit of 74, still today at work to create a piece of furniture which we feel is ours from the first to the last centimetre. Today’s meeting confirms the creation of Jackie, our new chair whose lively form is its greatest strength. The metal structure embraces the seat just as it did with the Hanna armchair. Its unmistakable lightness due to the structure in metal rods is like a chameleon. It gives the chair (and the habitat in which it is placed) a different personality according to the choice of the finish, available in black, embossed metal (vigorous and super-modern), chrome plated (sophisticated and precious as a jewel) or brightly coloured (more lively and vivacious). Developing a chair of this type is a challenge equal to any of the more traditional upholstery projects. It requires extraordinary experience to select the materials, the use of modern production techniques and the choice of the most suitable upholstery, keeping in mind those which react better to the tension. Not to mention the comfort and the proportions. Yes, the Committee has set its sights even higher. Today we are facing an extremely ambitious challenge, aware that an artisan laboratory such as ours, which has always made tradition its core business, can now use both new and antique techniques, elaborate and promote new projects ranging from the most traditional – as we have always done and will always continue to do – right up to the most contemporary and modern projects. Welcome back Committee and say Hello to Jackie!